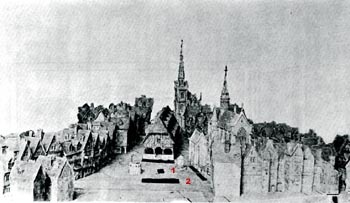 On May 30, 1431, the eve of the feast of Corpus Christi, Joan was led to the old market square of Rouen. She was tied to a stake surrounded by a pile of firewood ready to be lighted. From her neck a placard was hung with the words: “Heretic, apostate, and idolater.” A great crowd was present in the square. Six hundred English soldiers guarded her. In a few minutes everything was finished. The ashes were swept into the waters of the Seine River. Even the heart of the Maid, which remained intact since it had not burned in the flames, was cast into the river. We can comment on several points in this very beautiful martyrdom. First, the injustice of the sentence on the placard hung around her neck causes indignation. She was a saint – a virgin who had accomplished the mission God gave her to save the French people. And now she was going to be burned at the stake on the orders of French Archbishop Cauchon, the president of the tribunal, for an infamous reason. To understand the significance of this, I ask that you, you who have offered your lives to fight against Progressivism, imagine that you were condemned with a placard around your neck with the word “progressivist” written on it. It would be an analogous unjust injury, a similar fabrication, a comparable lie. Second, there are her words about the voices from Heaven. 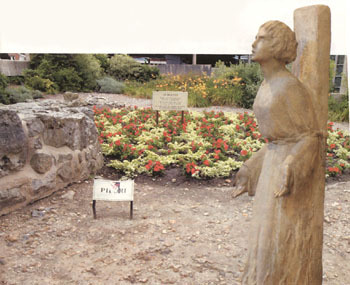 She used to say that those voices came to her from Heaven; and that it was by following the orders of those voices and through the strength communicated to her by them that she had accomplished the marvelous work that she did – the partial liberation of France and the restoration of the legitimate King. On the contrary, the tribunal that judged her – a mixed tribunal, ecclesiastical and civil – affirmed that all those wonderful victories she achieved over the English troops were accomplished through witchcraft. They said that the English army had been defeated because she had made a pact with the devil. Therefore, according to them, the voices came from Hell. The problem, then, was not to determine whether the voices were true or not. No one questioned that fact, because they still were not yet under the deleterious influence of the systematic doubt of Protestantism. People had faith and knew that this kind of communication was not rare. The problem was that the tribunal had to say that the voices were coming from Hell because they did not favor the Kingdom of England. It was for this reason Joan was condemned as a heretic, a witch, etc. For this cry she chose the perfect, supreme, and most tragic moment, the moment when she was already being consumed by the fire. The members of the tribunal were present assisting at the scene, the English soldiers standing guard, the Catholic people watching. She was tied to the stake, the flames were growing rapidly since the wood was soaked with oil. The fire was rising from bottom to top, so it had not yet reached the vital parts of her body. Above, the city square of Rouen. The smaller black box (marked 1) indicates where she was burned. The larger one (2) shows where the platform for the authorities was set up. This testimony given at the hour of her death is a supreme act of heroism – more worthy than her triumphal entrance into Reims beside the King who would be crowned there, more glorious than her first triumphal entrance into Orleans, and more splendid than all her epic deeds. That shout at the moment her soul was leaving this earth to be judged by God is truly marvelous! Third, that the flames consumed the body but spared her heart is also something very beautiful. To have heart is not to be sentimental. To have heart is to have strength of soul, great value, love for elevated things, love for the supernatural mission God gave us. And if ever someone had heart, this one was St. Joan of Arc. Thus the beautiful fact: the body was consumed by the fire, but not the heart. It was a miracle of Heaven to confirm what she had just affirmed minutes before, that the voices came from Heaven. She was already in Heaven but her heart was still on earth confirming the truth she had spoken. The English commanders understood quite well the danger in keeping that heart. They sensed keenly the devotion that this heart would inspire, and they had a great fear of that heart, just as the Jews had fear of the Cadaver of Our Lord and sent guards to watch over His Sepulcher. For this reason then, the English cast her heart into the river. It is the characteristic hardness of the impious that should not surprise us.